Notification. Candidates who are having necessary educational qualifications they submit their application form to Directorate of Forensic Science Laboratories from 16-10-2017 to 31-10-2017. Candidates selection for this Forensic Laboratories recruitment through written test only. 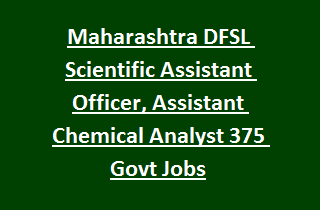 Candidate must have qualified Degree in Science Group for applying this DFSL Recruitment of Scientific Officer, Scientific Assistant and Assistant Chemical Analyst Jobs. Age limits, educational qualifications, application submission procedure, exam syllabus and Pattern details DFSL Recruitment Exam 2017 is given below. There are total 375 vacancies in this DFSL Recruitment 2017 Notification. Organization: Directorate of Forensic Science Laboratories. As on 01-10-2017 General candidate age limits are 18-38 years and for reserved candidates 18-43 years. Candidates will be selected based on written examination only. Initially based on candidates merit they will be shortlisted for written exam. Exam syllabus will be PG level only. Candidates download the Annexure 1 application form from the given notification. Fill all the required details and attach the self attested marks sheets, community certificate, age proof and other required docs. Send the application form your nearest regional office to be reachable on or before 31-10-2017. Regional Office address details are given in official website.